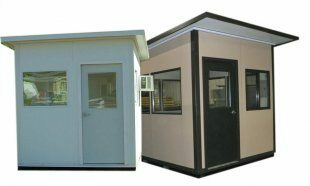 Now carrying prefabricated buildings in stock! We now have pre-fabricated guard buildings that are wrapped and ready to go. They can be on-site at your location in just a few days! Buildings are complete and ready to use. These high quality aluminum paneled booths are fully insulated and completely wired with heat and air. They are easily moved from one location to another on a built-in steel forkliftable base. Call 1-800-636-3873 FREE for more information.